Tim 'TheTrooper97' Watts has taken his vlog to new heights and new directions in 2018. When it comes to storytelling, former underground poker dealer turned entrepreneurial vlogger Tim ‘TheTrooper97’ Watts, has no shortage of material. If you ask Watts to tell you a story, he’s going to tell you a good one. Luckily for Watts, he only lost $200 to the brazen robbers that day and today, the only thing he routinely has pointed at him is his DSLR camera – and that he holds himself. Watts is one of the poker vlogging pioneers, a rapid-fire personality with an all-in approach to life. His YouTube Channel has drawn in over 30,000 subscribers and holds over 600 videos, each one revealing his man-about-Vegas world to those who want to take a walk on the Watts side. Whatever there was to gamble on the man they call “Trooper” would throw down on. So when he was invited to a home poker game in South Carolina, where he was living, in the post-Moneymaker boom, he gladly took a seat. As the deal was passed around, Watts found he had a flair for pitching cards – one he picked up from dealing himself blackjack hands at home by himself, just to get a feel for some action. The guy who ran the game took notice and the next thing he knew, he was dealing on the Greenville, SC underground poker circuit. Making money in those same houses that eventually would be targeted by both cops and robbers alike. Watts would eventually leave the underground games and spend years moving to and from Las Vegas, making ends meet while still playing poker. He was hustling, trying to make things better for himself. It’s now January 2012 and Watts and his buddy decided to travel to Biloxi, MS to play some single table satellites for a poker series. Making money sounded pretty good at that point. Watts, after seeing other vloggers on YouTube do their thing, took yet another gamble. He grabbed a camera, turned it on himself and started talking to it, allowing his larger-than-life personality to take over and be the centerpiece for whatever his young channel would become. 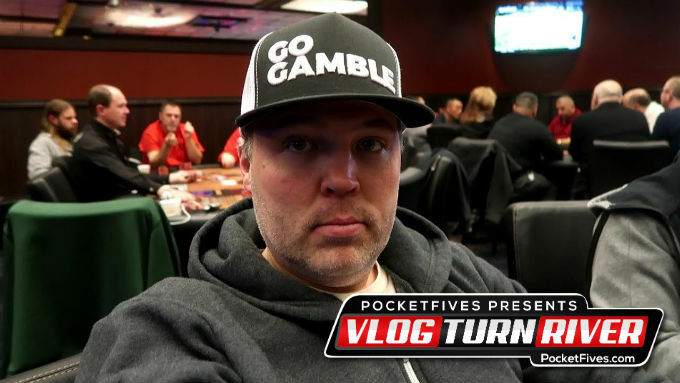 Those shenanigans and quite a bit of poker content have helped Watts create a loyal community that follows his Vegas adventures, attend a weekly meet-up game at Las Vegas’ Westgate, decked out in Watts’ trademark “Go Gamble” gear. When you ask Watts what he thinks his own vlog is about now, almost four years into making his vlog a near daily pursuit, he seems to be torn. But for Watts himself, the one-time potential money-making scheme of turning views into ad revenue has evolved a bit. While poker and vlogging have resulted in a pretty good gig for the one-time waiter, he’s indicated that this is not all there is. His obsession with Starbucks and coffee, in general, may be the clue to what comes next for Watts. His vlog has afforded him many opportunities, awakening his entrepreneurial spirit and allowing him to travel to parts of the world he may have never gone, but he insists that even though he’s been recording his daily routine for nearly four years, it’s just the beginning for him. The story as it’s currently being told certainly is a good one, but he understands that at some point it will have to change.